Are developers responsible for promoting healthy user engagement? “Be more aware of how you and your kids use your devices.” Beyond creating and maintaining an awareness of how frequently you use your applications, it’s important to pass on these principles of mindfulness to future generations. In recent years, organizations such as the Center for Humane Technology (formerly known as Time Well Spent) have been promoting the idea that developers who are creating new technology should be mindful by respecting the user’s attention and not demanding more engagement than is necessary to perform the functionality of the application. What can iOS app developers do given the time-usage updates to the platform to make applications less like junk food: easy to consume in the short-term while being a long-term negative influence to the user? How can we continue to hit engagement metrics in our apps while abstaining from less desirable engagement tactics? 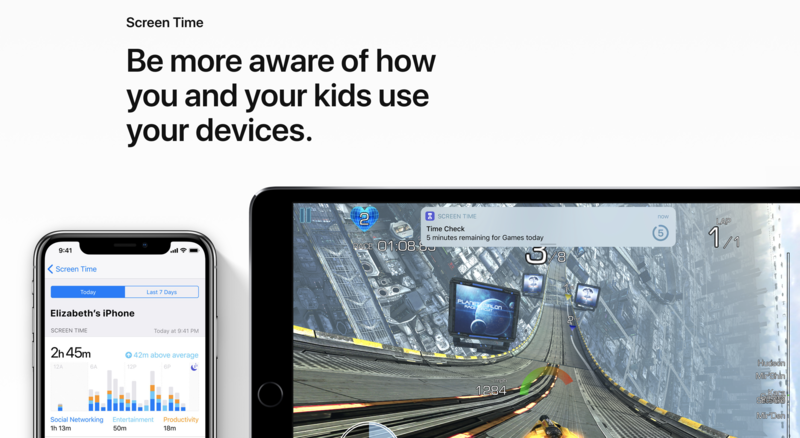 iOS 12 introduces screen time limits for the user and for their kids through parental controls, more granular notification management with a focus on allowing users to more easily silence notifications, and do-not-disturb improvements. How developers can take action and work with these changes can be broken down by feature. If someone is spending a great amount of time in an application and they have some amount of desire to fix it, then they can easily set a limit on how often they can use that application or category (social media for example). In order to develop an app that would prevent users from wanting to use screen time, the application should provide fast and clear exit points so that the user can quickly complete their task. For example, when a user is scrolling through a photo sharing app, their exit point would be when they have seen all of the most recent pictures from friends. When the majority of social media apps used a chronological order for a user’s feed, it was very clear where the recent content ended. With the introduction of algorithmic feeds, and eventually stories, users are much more confused where the content ends and therefore spend more time within the app than is needed to accomplish their task. In other words, find the fastest way a user can finish a task then clearly communicate to the user that the task is completed. This is not only good design, but it respects the user’s time in a mindful way. iOS 12 brings the quieting of application out of the settings app and into the notification tray where the option to manage notifications is visible with a single swipe. Along with the screen time features that allow users to see how much they use an application, these management features for notifications will allow users to more easily take action on limiting their entry points to an application that is constantly asking for attention. This brings up the question: what is just the right number of applications so as not to annoy a user so much that they silence an application potentially for good? There is no right answer, but thinking of necessary actions for the user to make and using as few notifications as possible to accomplish that goal is a good starting point. Obvious cases such as direct, user-to-user communication necessitate notifications, but the requirement gets less clear when it’s a user being notified about content. Have they indicated direct interest in it? Or is it algorithmic? If it’s an algorithmically-determined interest, did they opt-in or would they have to opt-out? Considering the page a notification brings a user to is also something to think about. Are there easy exit-points or does it further rope the user into spending more time in the app? All of these questions relate back to the design patterns and dark patterns that are or are not in the application. Minimizing time required to complete an application’s core tasks. Provide clear exit points for core actions with minimal distractions. Notify only when truly necessary or when the user opts-in. Be honest; treat others’ time as you would want yours to be treated.